Omar has taken advantage of the programs WRVC has had to offer. He has acquired the academic and technical skills needed to succeed in a knowledge- and skills based economy. He has already earned six college credits and can earn an additional six when he passes two proficiency exams at the end of the year. Omar’s post-secondary plan is to earn a bachelor’s degree in risk management by attending USM in the fall. He is also completing his internship at a local insurance company. Omar stands out not only because he has earned high grades in his business studies, but also because he has demonstrated specific traits employers seek, welcomes constructive criticism and, as president of FBLA, has worked hard to motivate members to raise money by organizing a raffle, clothing and book sale. 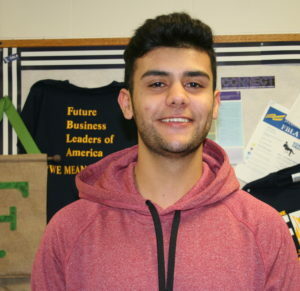 Omar and students from each of the 27 CTE Centers and Regions will be recognized on April 28th at the Green Ladle in Lewiston. Three $1000.00 dollar scholarships will be awarded that evening.